With more than 50 years of history and 70 active members, Hammersmith Chess Club is a lively place to play a few games! Founded in 1962, the Hammersmith Chess Club is a quite well-established English chess club. 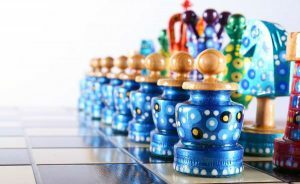 With more than 70 active current players, it’s actually one of the largest chess clubs in London! 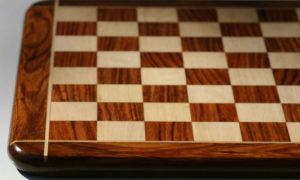 The Hammersmith Chess Club prides themselves on being progressive and inclusive, so potential members can rest assured that they’ll be accepted there no matter what their background or skill level in chess. In the same year that James Bond first came to the silver screen, 22 chess players got together at Westcott Lodge to engage in some camaraderie and chess playing the would eventually become the official Hammersmith Chess Club. 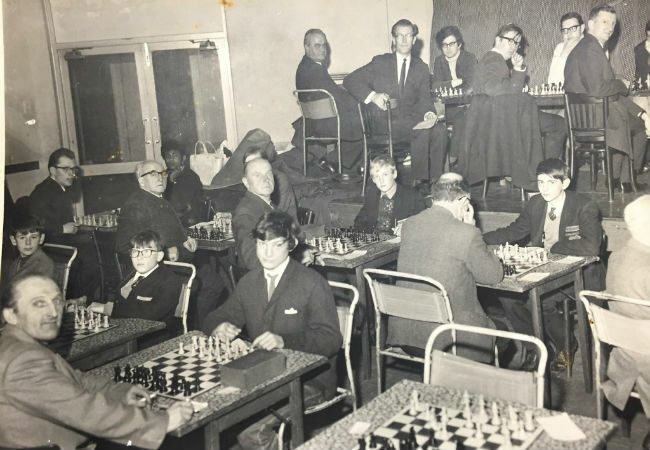 The club was helped into existence by the Hammersmith Borough Council, which organized an open chess tournament the previous year to stir up interest in a local chess club. The council also provided a handsome cup for the winner of the competition, to sweeten the pot even more. For several years, the club operated relatively informally, only electing their first president in 1966. That president was Lady Herbert, a woman well known in the chess circuit at that time. By now, membership had risen to 35 active players, and the price for membership was 30 shillings! This was in a time before English currency had been decimalized. 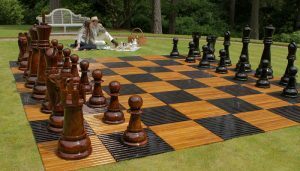 In 1968, the club attracted the attention of British Chess Champion Dr. Jonathan Penrose, who gave a simultaneous display at a club meeting. Two club members actually managed to draw with the illustrious chess master! Through the years, many events were held by the club, and many notable players passed through its ranks, including Julian Hodgson, Carsten Pedersen, CJ De Mooi, Sue Maroroa, and Keith Arkell. Regular Club Night meetings are held every Monday night at a local hall. Over the summer months, a change of pace is in order, and meetings are held at a local pub. For the most up to date information on meeting times and places, it’s best to get in touch with them directly by using the contact information provided at the bottom of this page. 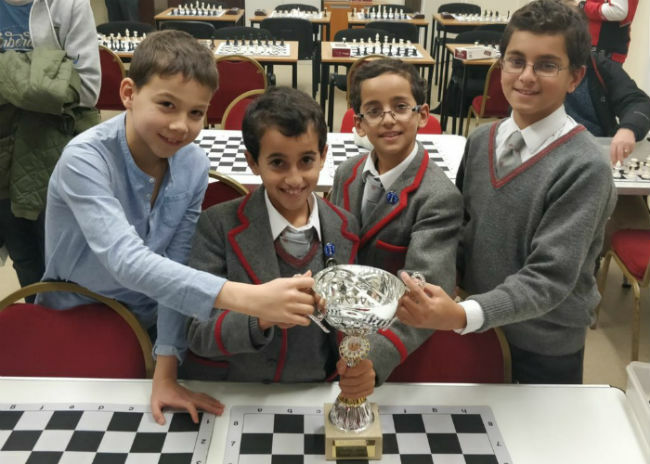 Aside from its weekly meetings, there are a number of special events that Hammersmith Chess Club members are involved in, including the Summer Chess League, annual trips abroad, and charitable fundraising events. Hammersmith Chess Club was one of the founding members of the Summer Chess League, along with the Battersea Chess Club, who are also featured in our Chess Clubs section! 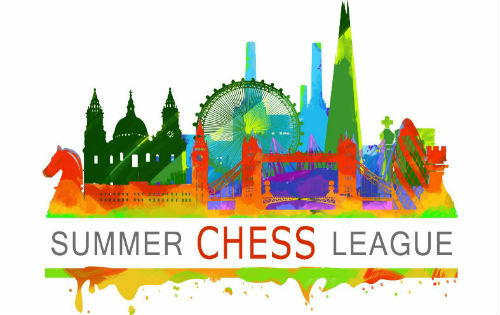 The London Summer Chess League is an organization made up of several different chess teams who compete against each other in friendly tournaments during the summer months. It’s great fun for all involved, and Hammersmith teams usually do quite well in the final rankings! Every year, some of Hammersmith Chess Club’s members go abroad to play against members of another chess club. 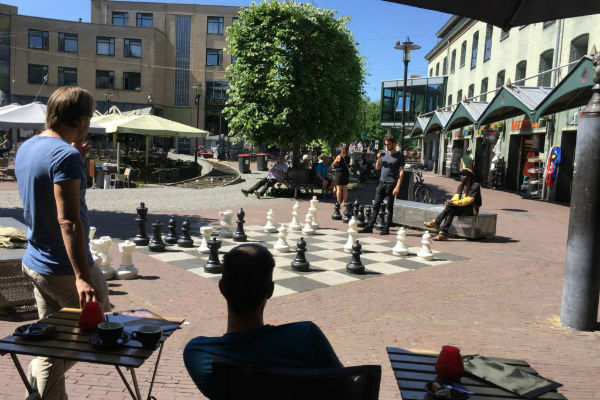 It’s great fun for all who participate, and for many members, it’s the foundation of a chess vacation that they look forward to all year! There’s a lot of negotiation and behind the scenes work that goes into choosing a location and a club to play against, but in the end it’s well worth the extra effort! Locations that Hammersmith Chess Club has visited lately include Cork, Amsterdam, and later this year they plan to go to Breslau, Poland! 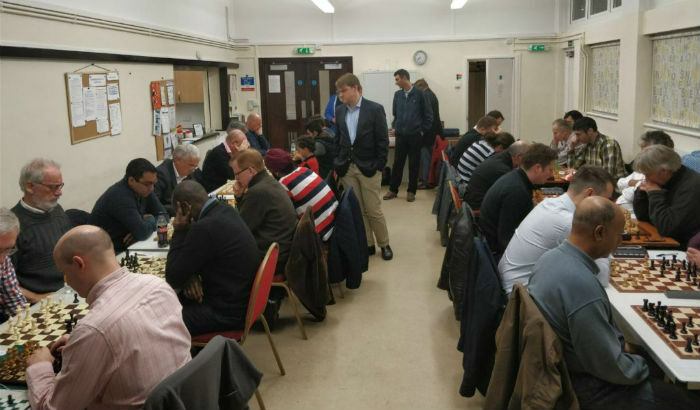 In between international journeys, the Hammersmith crew are also happy to return the favor by hosting travelling chess clubs at their location and showing them the best that London has to offer, particularly its chess scene. A giant chess game outside the Max Euwe museum, Amsterdam. It’s not ALL fun and games at the Hammersmith Chess Club. Though they certainly know how to have a good time, whether it be at home or abroad, the organization is also interested in giving back to its community. 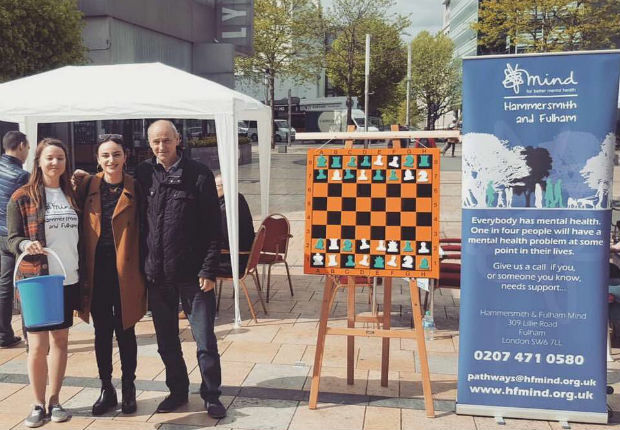 In a joint effort to revive the London chess scene and raise money for mental health charity, MIND, Hammersmith members took to the streets in 2017, setting up a booth in the middle of Lyric square where passersby could play chess, get expert advice on improving their game, and make donations to benefit MIND. Over the course of that day, countless games were played by people of all ages and backgrounds, and more than 400 pounds were raised for MIND! Not bad for a day of fun and games. More than 400 pounds were raised for MIND by Hammersmith members! These events are really just the tip of the iceberg when it comes to what’s going on at Hammersmith Chess Club. Their ample membership numbers allow them to host many different events and activities for players of all different skill levels, including blitz competitions, season-long rapid play competitions, and even a rapid play league. There are currently 11 different teams at Hammersmith Chess Club, catering to all different ages and abilities, so there’s certainly something for everyone! There are several different membership options available to those considering joining the Hammersmith Chess Club. Full membership for adults is available for a 65-pound annual membership fee, reduced to 40 pounds for your first year. A concession rate of 40 pounds annually is available for players under 18, senior citizens, and anyone who is unemployed. This membership makes you eligible to represent the club in league games. 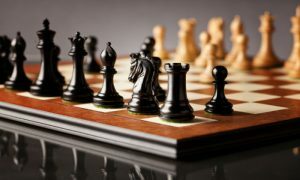 If you’re not interested in participating in any chess leagues, you may choose to go for the Associate membership, which is only 30 pounds per year. This membership grants you access to all club events and functions, but you may not participate in league games. There are also discounted rates for partial season memberships and memberships for players with any FIDE title. Hammersmith Chess Club is a fine organization that is making a difference not only in the lives of its members, but in the lives of so many others both in its home community and abroad. 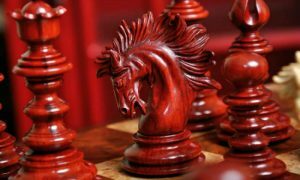 It’s truly remarkable, the level of commitment that members have shown to keeping the game of chess alive and well, and doing some good while they’re at it. The level of commitment that members have shown to keeping the game of chess alive and well is remarkable. We can’t recommend the Hammersmith Chess Club highly enough. 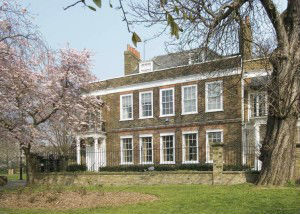 If you live in the London area, or even if you’re just passing through, you ought to stop by and visit them sometime. Hammersmith Chess Club members are notoriously friendly and welcoming, so you have nothing to fear in dropping by the local hall or pub on a Monday night to see what it’s all about. With membership rates quite reasonable and a wide variety of events and activities available for players of all skill levels, there’s really no reason not to join up! Use Coupon Code CSCOM for 10% Off! 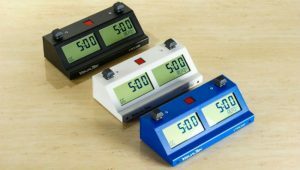 Use Coupon Code CHESSITETCS for 10% Off! 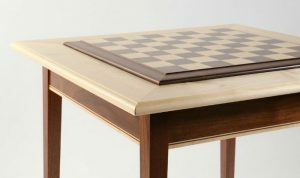 Use Coupon Code CHESSSITECB for 30% Off!